What’s so great about frozen peas? Peas contain a fair amount of fiber and antioxidants. Their calorie content is fairly low, with 62 calories per 1/2-cup (170-gram) serving and peas have protein! Peas also contain many essential vitamins and minerals. So eat your peas! And when you purchase the NFCA’s Northeast Grown Frozen Fruits & Vegetables, you are not only making a good decision for yourself and your family, you are helping to grow the regional food system and economy. 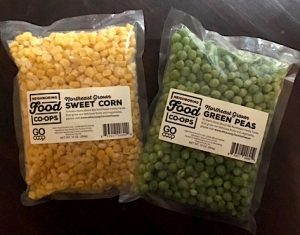 Our frozen Blueberries, Organic Broccoli, Organic Edamame, Organic Green Beans, Green Peas, and non-GMO Sweet Corn are all produced, picked, processed and packed (say that five times fast) right here in the Northeast. And they are available only at your local Neighboring Food Co-op. They’re easy to find: they’re packed in a clear package so you can see what’s inside! Looking for an easy recipe? Try one of these — and let us know if you have one of your own that you’d like to share! An quick and easy recipe great for dipping or as sandwich spread. Vegan and gluten-free too! 1. Let peas thaw at room temp for 10 to 15 minutes. 2. 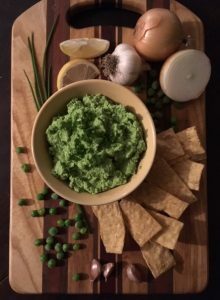 In a food processor or blender combine the garlic, peas, olive oil, onion, lemon, and salt. 4. Scoop into bowl, garnish with chopped chives. Corn chips or crostini work well for dipping. Succotash is a dish built around corn and some kind of bean or legume. Succotash is from the Narragansett word sohquttahhash, meaning “broken corn kernels”. This traditional dish, a combination of a grain with a legume, is high in essential amino acids. Other ingredients may be added including tomatoes, green or sweet red peppers, and okra. Succotash can also be made using bacon or chicken broth, but here is an easy vegetarian version. 1. Sauté onions in olive oil until translucent. 2. Add corn, salt and pepper. 3. Add garlic, and cook until garlic is fragrant, about 2-3 minutes. 4. Stir in peas, simmer until peas are heated, about another 2 minutes. 5. Remove from heat and stir in fresh basil, and parsley. 6. Serve hot, warm, or at room temperature.